The Russian government has been accused of trying to kill another pro-West politician. Again. The most recent almost-victim is Montenegro’s former president and prime minister Milo Đukanović. This latest allegation against the Kremlin is just one of many it has had to defend itself against over the years. Funny how that keeps happening, right? Sources told The Telegraph this week that Russian-backed Serbian nationalists disguised as cops planned to launch an attack on the parliament building in October of last year and kill Djukanovic, the prime minister at the time. Though Russia has denied the accusations, U.S. and British intelligence officials claim they have encrypted phone calls, email traffic and testimony from plotters-turned-informants that a violent coup was, in fact, in the works. So far, some 21 people are accused of trying to overthrow the Montenegrin government because of its desire to join the European Union and NATO. In a way, what Russia conducts is a very old kind of warfare—extrajudicial killings—taken to new and brazen heights, against its own citizens or anyone deemed to be a threat. So why does this keep happening with Russia? Much of it has to do with the fact that its civil institutions—its court systems, elections, police structures—are all considered extremely corrupt The New York Times reported a Pulitzer-winning series in 2010 that detailed how Russians are suffering on their country’s crumbling justice system. The series—which is a must-read for anyone who wants to understand how modern Russia works—examined jury tampering, the suppression of dissenters, the murders of journalists, and the general sad state of the country’s justice system. Clearly, things have not gotten better. Earlier this month, Russian activist and Kremlin critic Evgenia Kara-Murza fell victim to a near-death poisoning for a second time during a trip to Moscow, according to USA Today; his condition is similar to what he experienced during a 2015 trip to Moscow when he was also poisoned. Kara-Murza was a close friend to Boris Nemtsov, a Kremlin opposition leader who was shot and killed several hundred yards from the Kremlin in 2015. Russian FSB officials, according to a document provided to the Telegraph in 2011, authorized the murder of enemies of the state who lived abroad. It is dated March 19, 2003, just four years before Litvinenko’s death. The objectives, the directive says, are “observation, identification, possible return to the Russian Federation” of their targets. But it also allows for “under special directives” the “elimination outside of the Russian Federation in the countries of Near Abroad [former Soviet states] and in the European Union, of the leaders of unlawful terrorist groups and organisations, extremist formations and associations, of individuals who have left Russia illegally [and are] wanted by federal law enforcement”. Apparently with leaders of rebellions in the Caucasus in mind, among others, it names the crimes of those sought as terrorism, “extremist activity,” murder, kidnapping and “others classified as especially serious crimes against citizens of the Russian Federation and directed against the Russian state and government”. The order sets up the “intensive training of the newly formed groups and units in relation to specific conditions of work in Western Europe and countries of the European Union”. It says there will be “in-depth training of individual agent-analysts for work in the countries of European Union”. It is signed at the bottom by Col General Nechaev, First Deputy Head of the FSB counter-intelligence branch and also bears the organisation’s stamp. But it is very difficult to believe that all of these deaths and murders are not somehow connected to the Kremlin. Putin has long repudiated NATO as a threat to Russia’s national security, so taking out foreign threats, like Đukanović in Montenegro, has a clear benefit to his regime. Keep in mind that the Kremlin has also been accused of poisoning former Ukrainian president Viktor Yushchenko’s food with dioxin in 2004 because he co-lead the “Orange Revolution” that sought to take Ukraine out of Russia’s sphere of influence and into NATO and the EU. As of now it’s near-impossible to confirm that Putin is behind the murders of the many journalists and political opposition leaders who have ended up dead. However, what is clear is that opposition to the Kremlin is clearly not welcomed. We only have to look back to the national anti-government protests that took place in 2011 through 2013, when tens of thousands of Russians accused the state of overseeing corrupt parliamentary elections. The unusually large crowds shocked Putin so much that he accused former Secretary of State Hillary Clinton of funding opposition parties to undermine his authority at home. The result of those protests ended with Putin’s Duma-lead party, United Russia, passing harsh anti-protest laws that can jail protesters for as long as five years of forced labor and/or more than $28,000 in fines. Putin also signed into a law legislation that requires Internet companies to store data on its users who live in Russia for years. Critics argue the law is designed, in part, to prevent activists from organizing online. Pavel Durov, founder of Vkontakte, the Russian Facebook, was forced to leave the country after Russian authorities cracked down on him after he refused to hand over the data of anti-government protesters. “Unfortunately, the country is incompatible with the Internet business at the moment,” the VK founder told The Hollywood Reporter. Durov left because trying to conduct business in Russia wasn’t worth his life. 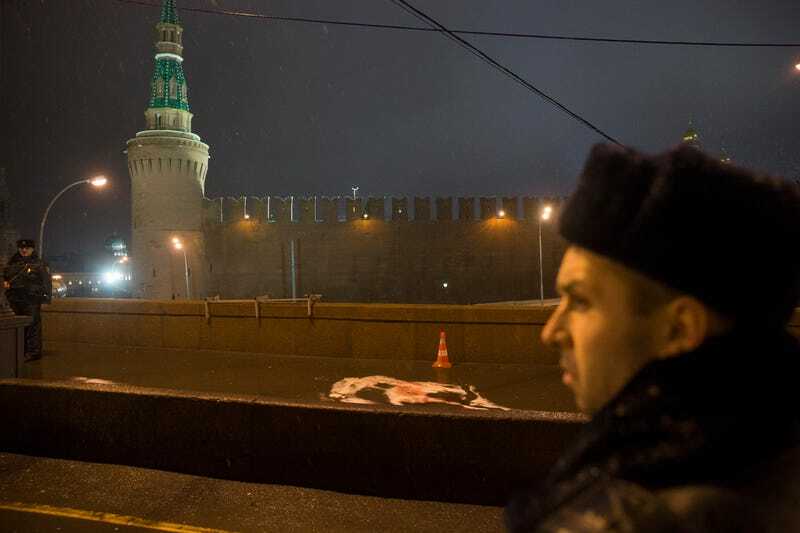 But for Russians who choose to stay in the country to fight the Kremlin or those who live within their own borders and join institutions Putin views as a threat, death seems to curiously find its way to their doorsteps. And their killings remain unsolved. While Russia has been the subject of intense media scrutiny over the deaths of opposition activists and anyone else who challenges the Kremlin, it is important to note that it is not the lone nation in the world that has a history of state-sanctioned murder or election interference. Far from it. The United States, for example, has an equally troubling history of overthrowing or attempting to overthrow governments—directly or indirectly—in places like Argentina, Iran, Cuba, Colombia and many more. Ironically, Putin lamented the hypocrisy of Washington’s claims of Russian imperialism by arguing at the UN in 2015 that Washington created a power vacuum that essentially rolled out the red carpet for terrorism. It would suffice to look at the situation in the Middle East and North Africa, as has been mentioned by previous speakers. Certainly political and social problems in this region have been piling up for a long time, and people there wish for changes naturally. But how did it actually turn out? Rather than bringing about reforms, an aggressive foreign interference has resulted in a brazen destruction of national institutions and the lifestyle itself. Instead of the triumph of democracy and progress, we got violence, poverty and social disaster. Nobody cares a bit about human rights, including the right to life. I cannot help asking those who have caused the situation, do you realize now what you’ve done? But I am afraid no one is going to answer that. Indeed, policies based on self-conceit and belief in one’s exceptionality and impunity have never been abandoned. It is now obvious that the power vacuum created in some countries of the Middle East and North Africa through the emergence of anarchy areas, which immediately started to be filled with extremists and terrorists. Though there is a difference between the U.S. and Russia. Where Americans may feel despair in their justice system, many Russians have simply given up. As flawed as America’s justice system is, it is nowhere near as bad as the one Russians have to endure. America has its own issues with unfair court systems and police brutality—look at the Black Lives Matter movement and other protests that have sprung up in recent years attempting to address this very problem—but Americans do believe the process, flaws and all, can work for them if they force it to. In Russia, not so much. We also have to keep in mind that political opposition here in the U.S won’t get you jailed and killed. In Russia, it is sadly common. There is nothing commonplace about top political leadership being murdered just blocks from the White House. The U.S. may not be perfect, but its civil society is much more intact than Russia’s by any measure—and Russia’s is so damaged that we may never see an end to the killings. Terrell Jermaine Starr is a senior reporter at The Root. He is currently writing a book proposal that analyzes US-Russia relations from a black perspective.